Worldwide, cultures have found the spectacle of light bouncing off water droplets to be a symbol of hope and spirituality. Ancient Greek and Hindu mythology see the rainbow as a bridge between Earth and Heaven, while in Judaism and Christianity it’s evidence of God’s promise not to flood the Earth again. For the literal-minded, it’s a beautiful demonstration of geometry written across the sky in beams of light. As you know from your experiments in science class, white light is made from a combination of other colours all added together. Shining this light through a prism makes it bend. The amount of bending – in scientific terms, refraction – depends on the wavelength of the light. Red light has the longest wavelength and bends the most, while blue light has the shortest and bends the least. Sunlight is made of a continuous spectrum of different wavelengths, so you see the whole range of colours blending into each other. In nature it’s water droplets, not prisms, that refract sunlight into rainbows. Mist, clouds, rain and sea-spray all produce droplets capable of making rainbow fringes. But what makes these individual prisms combine to make an arc? All rainbows are actually circular, but the centre of the circle is usually below the ground, so you only see an arc. From an aeroplane, though, it’s possible to see the complete 360 degrees. The rainbow will appear to keep pace with you no matter how fast the plane flies (as long as there’s still rain in the air) because it isn’t a physical object – it’s a pattern. 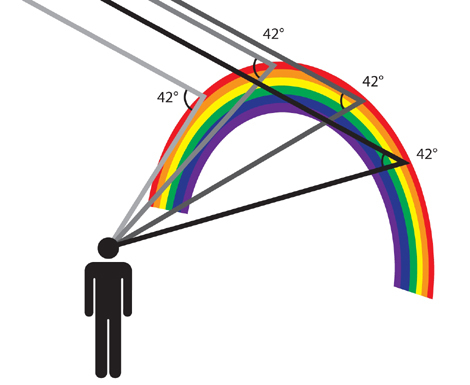 What you see as a rainbow is light bouncing off different droplets as you move. 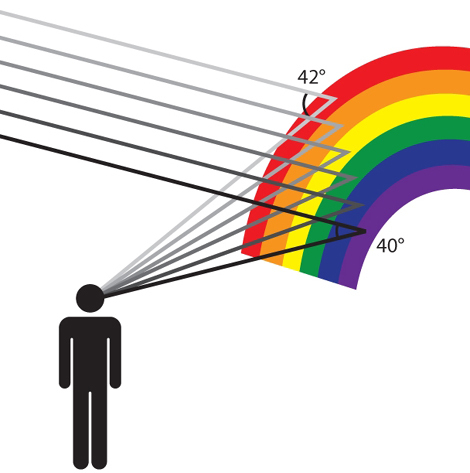 Your rainbow is made up of those light beams that have refracted by just the right amount to turn round and hit you in the eye. The equations of optics tell us that this only happens when you have your back to a light source, since the rays need to be bent by exactly 318 degrees from the angle they came in at. But that 318 degrees only defines the angle between your eye and the incoming sunlight. It can be pointing straight up, horizontally, or any angle in between. In fact the loci of the raindrops that will form your rainbow is the rim of a right circular cone. At the apex of the cone is your eye. The axis of the cone is a line taken down from the sun, through your eyeline, and ending in the ground – in other words the middle of the shadow of your head. The rainbow you see is personal to you, coming from only those raindrops that are arranged at precisely the right distance from your head and no one else will see exactly the same one. It might not be a sign from another world, but it’s still pretty special.